We offer another innovative range of pen stands which are manufactured by using premium quality teak wood. 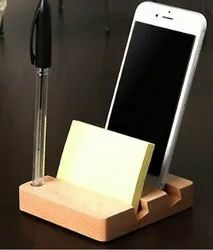 These stands are rectangular in shape and can contain numerous pens, pencils along with mobile phones in an organized fashion. These pen stands can be kept for a long period of 100 years without losing its texture & quality. We offer an exclusive collection of Wooden Mobile Stand which are manufactured with high quality wood. With hand made designs these stands are attached with small table clocks. Various types of pens and other accessories can be kept in these stands without any mess. Backed by our expert and experienced professionals, we provide Wooden Mobile Holder. With immense market knowledge, we have been able to provide optimum quality Wooden Mobile Stand. Add style to your home or office décor. Display your phone in a standing posture, so that watching videos or pictures is convenient. 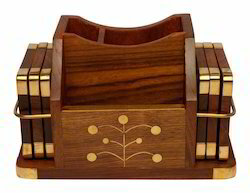 Enhance mobile phone joy and experience with this ethnic wooden stand.